The past month saw 7 of the BM members post three thalis each and I have the privilege of showcasing all 21 thalis in this post. 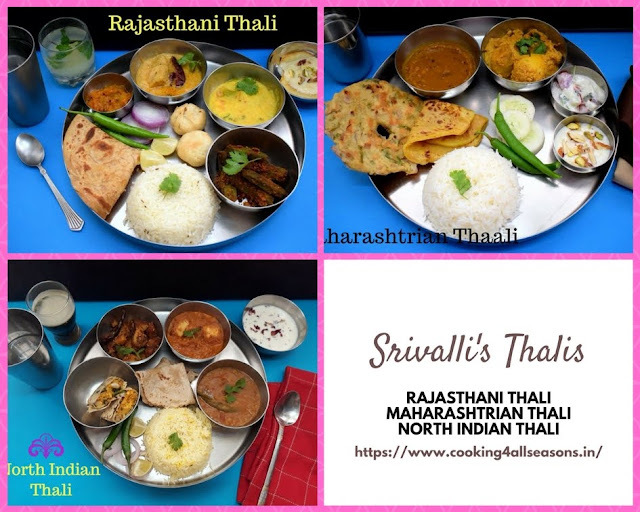 Go ahead and have a visual treat... For more details on the individual thalis, please visit their respective blogs. Srividhya sent in her elaborate Thalis. Manjula sent a variety of traditional thalis. 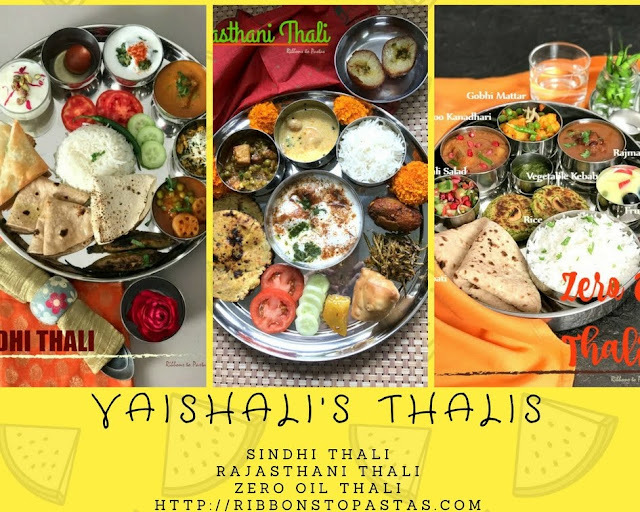 Vaishali sent in her creative thalis. 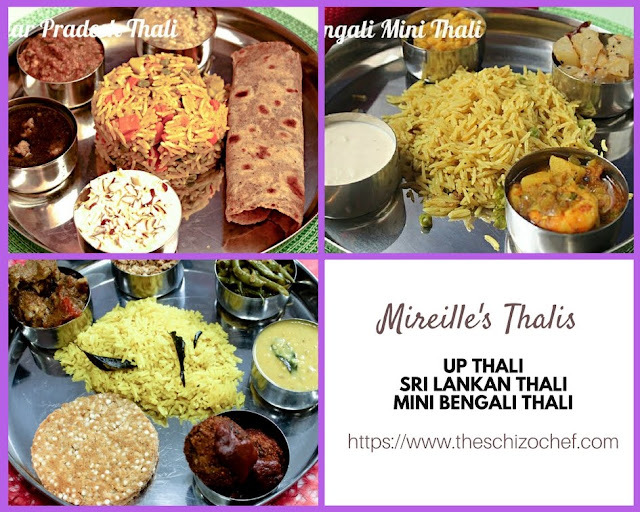 Mireille sent in her cute thalis. Srivalli sent in traditional thalis from different states. 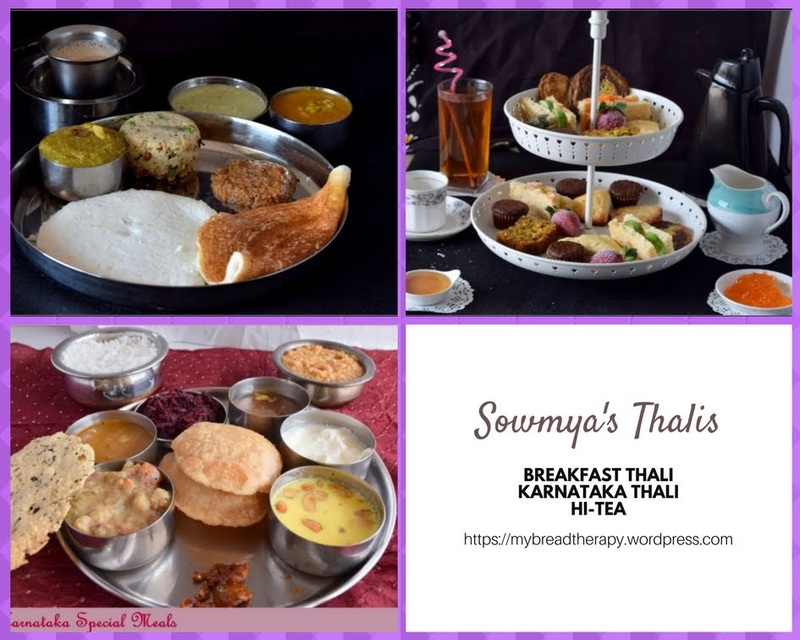 Sowmya sends in Karnataka style breakfast, lunch and tea thalis. And finally my contribution featuring a simple weekend thali, Ugadi and Festival Thalis. In an effort to include Kale in our diet, I have been using it as a substitute for Spinach in some of the traditional recipes. I have been happy so far with the response from my family. Here are some varieties I tried with Kale..
Hope to add a few more to this list. Soak Moong Dal for about 30 minutes. [I soaked it overnight]. Drain and set aside. In a heated pan, add oil and the rest of the seasoning ingredients. After the mustard seeds pop and the dals are golden brown, add in the moong dal and saute for a few minutes. Sprinkle turmeric and add the chopped baby kale. Gently saute until the kale wilts. Add in salt, sugar, red chili powder and peanut powder. Mix well and remove from heat. In a simple everyday meal pictured above, I have Paneer Methi Chaman, Roti, Salad, Rice and Kale Perugupachadi/ Raitha. There are numerous versions and methods used for this Paneer methi chaman but I love this version the best. In a heated pan add oil and cumin seeds. After they crackle, saute ginger-garlic paste for a few seconds and then saute onions until golden brown. Add in the tomatoes, turmeric, red chili powder, salt and sugar along with a cup of water. Let it boil and the mixture come together. Cover and let it cook for a few minutes. Add in the cooked methi leaves and shredded paneer. Mix well and let the flavors blend for a few minutes. Add milk to the simmering mixture let it come to a boil, sprinkle garam masala, cover and remove from heat after a couple minutes. This week I shall post some bookmarked recipes which we have enjoyed at home. In my childhood days, it was almost a weekly routine to mix pickle in either flattened rice or murmura. But this idea of adding apple and the rest of the ingredients was given by my friend. The spicy taste of the pickle balanced by the apple, the crunch of roasted peanuts and sev, was a true delight. 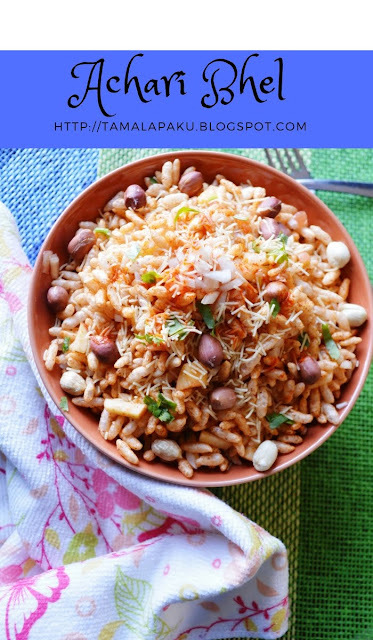 A delicious and spicy twist to the traditional Bhel!! Mix in toasted peanuts, finely chopped onions, finely chopped tomato and finely chopped apple. Serve in individual bowls, garnish with sev and finely chopped coriander leaves. 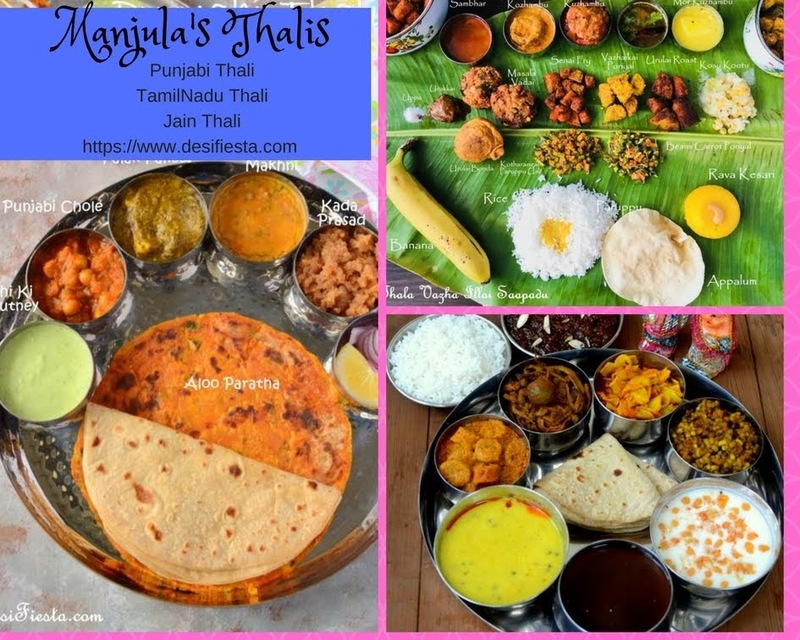 For the final day of this thali series, here is a festival thali which I put together a few months back when we had performed Sri Satyanarayana Pooja at home and invited about 50-60 friends. We do not use onion or garlic in the festival menu. Some of the dishes were outsourced and were not part of the actual Prasad but was included in the meal after the pooja. 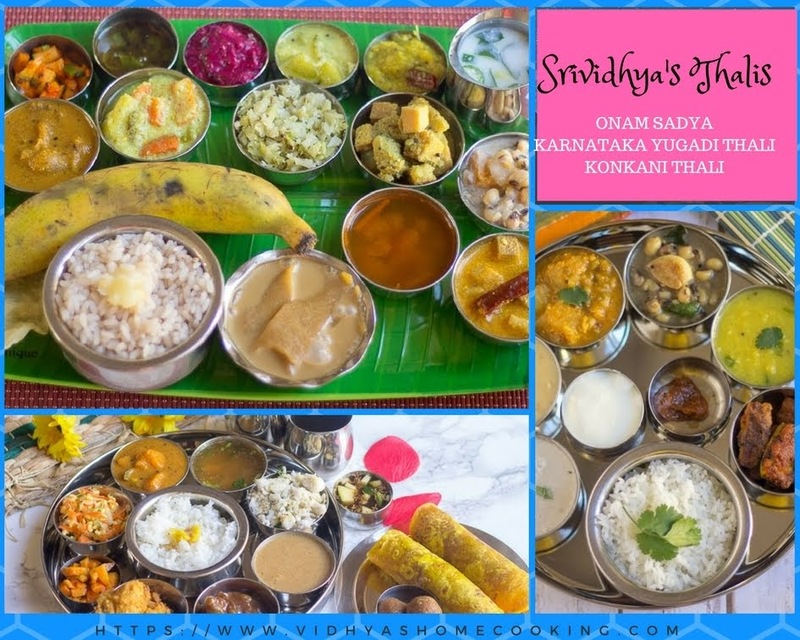 The meal includes, Cabbage-Green Beans Dry Saute, Chana Masala-No Onion No Garlic, Shahi Mutter Paneer-No Onion No Garlic, Palak Dal, Mysore Pak, Naan, Tamarind Rice, Rice and Fried Chilies, Yogurt, Gulab Jamun and Sambar-Vada. Naan, Mysore Pak, Gulab Jamun and Vada were the dishes which were outsourced. 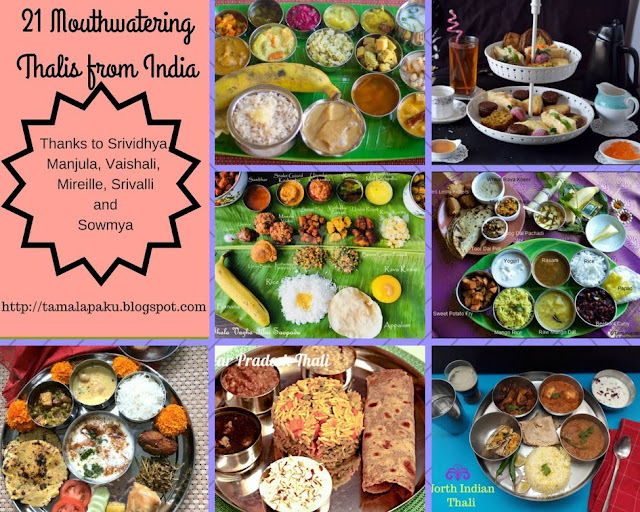 The Wheat Rava Halwa, Idli and Peanut Chutney are missing in the picture. I have mentioned the quantities of ingredients for a family for 4-5 as well as the actual quantities I used for the party (for future reference). Powder Cashews and set aside. Cube the paneer and soak them in hot water until needed. Thaw the frozen peas and set aside. Grind Tomatoes, ginger and green chilies and set aside. In a heated wok/kadai or a sauce pan, add oil and the rest of the seasoning ingredients. After the cumin seeds crackle, add the tomato puree, Red Chilli Powder and Mutter Paneer Masala Powder. Let the mixture cook well until oil floats on the top. Now is the time to add the cashew powder, milk and heavy whipping cream. Let the mixture simmer for a couple of minutes and then to adjust the gravy consistency add about a cup of water. Add salt and after the gravy is thick enough, slide in the drained paneer cubes and peas. Let it cook for a couple minutes and remove from fire. Sprinkle the garam masala and kasoori methi. Mix well and cover for a few minutes. Remove from heat and garnish with coriander leaves. 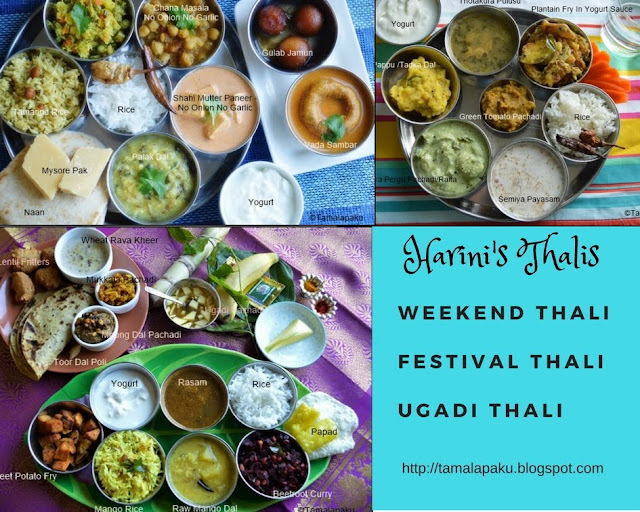 The festival spread this time was Mixed Lentil Fritters, Toor Dal Poli, Wheat Rava Kheer, Moong Dal Chutney, Mamidikaya Mukkala Pachadi (Raw Mango Pickle), Mamidikaya Pulihora/Raw Mango Rice, Sweet Potato Fry, Beetroot Curry, Raw Mango Dal, Poornam Charu (Rasam) along with Papad, Rice and Yogurt. The picture also shows Ugadi pachadi. In many families, it is traditional to use Chana Dal-Jaggery filling (Senaga Poornam) for Bobbatlu. But if I remember correctly, my paternal grandmother used only toor dal-jaggery filling (Kandi Poornam) as there were many in the family who could not tolerate Chana Dal. I know of many friends who are allergic to chana Dal. I am sure this Toor Dal filling would be a blessing for them. Wash and boil toor dal on the stove top until it is just tender. Add the powdered jaggery to the boiled toor dal and grind in a mixer to a fine paste adding cardamom powder. It should result in a stiff dough. Allow it to cool. Divide the dough into equal parts (about 8-9) and roll each portion of the dough into small circles. Put in at least a teaspoon of filling and close the edges. Gently place it on a heated tawa/griddle, drizzle a little ghee/oil and cook until both the sides are light brown. Remove the bobbattu from the tawa. Store in an insulated container. Continue with the rest of the dough. Serve them warm and enjoy! In the above meal, the Tadka dal complements the lack of dal in the Thotakoora Pulusu and is a classic combination in our families. The Snake Gourd(Potlakaya) Raita here is more like a sabji mixed in rice and is our family favorite. Here is the recipe for Plantain Fry in Yogurt Sauce. I referred Vahchef's recipe for this but instead of deep frying the plantains, I air fried them. I have made this so many times now due to popular demand at home. Make it to believe it. * I used an air fryer to 'fry' the rice flour coated plantain slices (another version of Aratikaya Bajji in other words). For an air fryer I used about 2 teaspoons of oil to make the bajjis. Peel the plantain and slice into thick slices about 2 mm in thickness and soak in water until needed. [Make sure to grease your palms before peeling to ensure a mess free cleanup]. In a mixing bowl, add rice flour, salt, red chili powder, ginger-garlic paste and make a thick paste adding as much water as needed. Drain the plantain slices and dunk them in the paste making sure all the slices are coated with the rice flour paste. Deep fry the plantain slices and set aside on paper towels for the excess oil to drain. In a heated pan, add oil and prepare the seasoning. Add mustard seeds, chana dal, urad dal, curry leaves and asafotida. After the dals are golden brown, add in the garlic and green chili, turmeric, salt and red chili powder. Saute for a few seconds (and be ready to handle the spicy fumes :) ). Pour in the yogurt, give a quick stir and let it thicken for a couple minutes. Reduce the heat and add the fried plantain slices into the yogurt sauce. Coat the sauce on all the slices and remove from heat. Serve hot with rice and Dal for a spicy meal. During our childhood, the few days before any festivals used to be a time for mom to make batches of goodies which included sweets and chaklis. Following that tradition, one of my friend's mom distributed sweets and this chakli a few months back. After eating that chakli, my older one pestered me to get the recipe from aunty and make it at home. After I got the recipe and was ready to make it at home, She told me not to tweak the recipe and to follow aunty's recipe to the T. That is what I did. It is always a pleasure to see the beaming smiles on the kid's faces, right? Wash and boil the moong dal with about 1.5 cups of water. Adding very little water, grind into a fine paste upon cooling. In a mixing bowl, add the rice flour, peanut powder, sesame seeds, cumin seeds, salt, red chilli powder, ajwain, asafoetida and the moong dal paste. Mix well so the moong dal paste is mixed well into the rice flour. Add in hot oil and mix well. Add water gradually to make a soft dough. Fill in the murukku press with the dough and I used the regular perforated plate. Heat oil in a deep pan, and on medium heat use the murukku press to drop in spirals of dough. Fry them until they change color. Drain them onto kitchen paper towels. Continue for the rest of the dough. Store in an airtight container upon cooling.